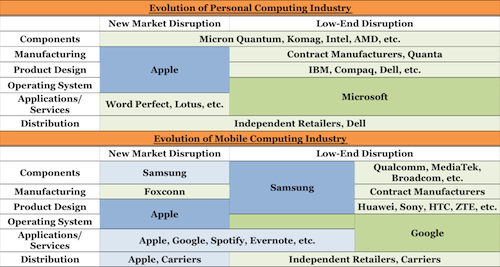 The evolution of the PC and mobile handset industry have been mirror images of each other, as both saw two distinct disruptions: a new market disruption, followed by a low-end disruption. The shift from integrated companies to modular competitors will pressure hardware profit margins across the industry, leading to the emergence of a new business model, i.e. hardware-as-distribution.